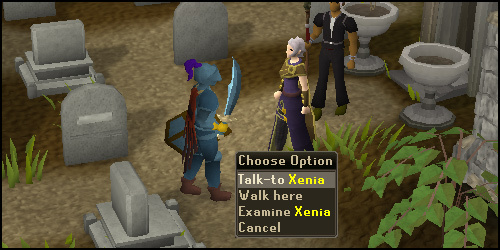 Speak to Xenia, a veteran adventurer found in the Lumbridge graveyard. 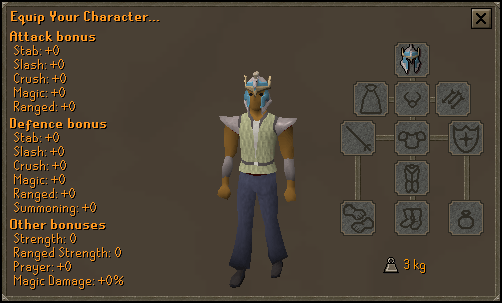 You can begin your quest by making your way down to the Lumbridge Graveyard, directly south of the Lumbridge Church. 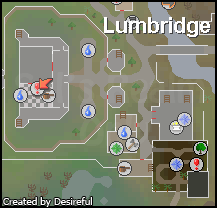 The easiest way to get there is to use the Lumbridge Home Teleport spell to get to Lumbridge. Once you have arrived, go outside the courtyard, and make your way south towards the church. Connected to the south side of the church is the graveyard. In the graveyard you will find Xenia, speak with her. After you have greeted each other, choose the option "What do you need help with?" She will explain the situation to you. 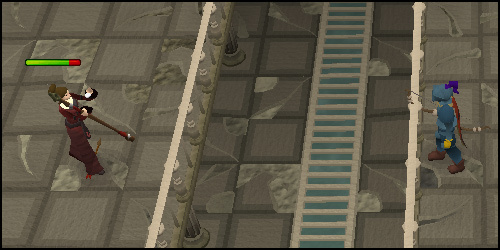 There are three cultists of Zamorak who have stowed away a prisoner in the Lumbridge catacombs. She is unaware of what they are planning to do, and she needs your help to figure out. Unfortunately, she isn't able to find out on her own (because of her age). She needs backup, so select the option "I'll help you." 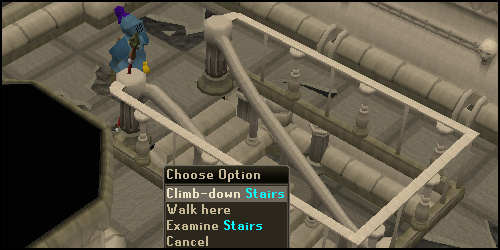 In the very east of the graveyard, you can find the stairs she mentioned. (or rather the catacomb entrance.) 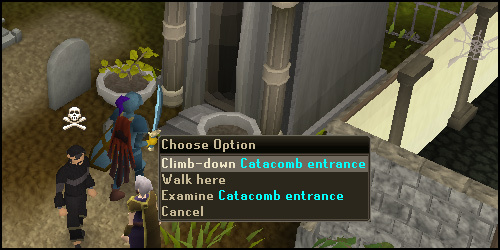 You must now climb down the Catacomb Entrance in order to proceed with the quest. Directly upon entering the catacombs, you will be shown a brief cut-scene with the three cultists, Caitlin, Kayle, and Reese. The three will be arguing, and something about a 'blood pact' will be brought up. This 'blood pact' somehow keeps the cultists together. After the cut-scene, Xenia tells you what to do. There's a guard in the room directly to the north, and Xenia thinks that you and her should be able to overpower him. At this point, it would be a good idea to turn off 'auto retaliate' because Kayle is a ranger. Before you go charging in to save the day, it should be a good thing for you to know this: If you run straight down the room, Xenia will be attacked, and you will have to start all over. Be sure to walk around the edges of the room until you reach Kayle and be sure not to go into the middle! Once you have gotten to Kayle you should attack him and defeat him. Kayle has only 20 life points and is a level 3, so it should be a very easy fight. Just before you knock the last life point out of Kayle, he starts to talk to you. He asks you if you were going to kill him. You have two options here. If you are looking to do this quest as fast as possible, choose the option "Die now" to move on to the next cultist. If you are more interested in the story line, choose the option "I have some questions." Kayle is happy to cooperate. You will ask Kayle three questions. (Who are you? ; Who are the others? ; What were you planning to do down here?) From these three questions, you will learn that Kayle is a ranger, Reese is the leader and was a former acolyte at Lumbridge Church, Caitlin is a dark mage and former wizard, and Kayle has no idea what they were planning to do. However, Kayle does know that Reese discovered something about these catacombs; something about how they were built. Caitlin had also found something at the ruins of the old Wizard's Tower, something that appears to be from Zamorak Wizards. They began to work together and realized that by combining these two things, they would have power over many things including life and death. The two made a 'blood pact' to go to the Catacombs. The two had traveled further into the Catacombs to perform the ritual, while he stood guard. Now that you have this information, you no longer have a use for Kayle. 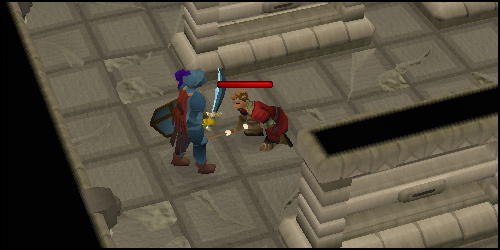 You can either kill him, or spare his life and get his equipment. Xenia doesn't believe that Kayle will be of any more trouble. Xenia tells you that the second cultist will be using magic and that you must use a ranged weapon to defeat him. Pick up the ranged equipment Kayle dropped, and continue into the next room. Across the room will be Caitlin, who also has 20 life points. Attack her, and she will be defeated just as easily as Kayle. Head to the south, where you can find a winch. This controls the spear wall. Operate the winch, and the spear wall will go down, allowing you to walk over to Caitlin. To save time, you don't have to question her. 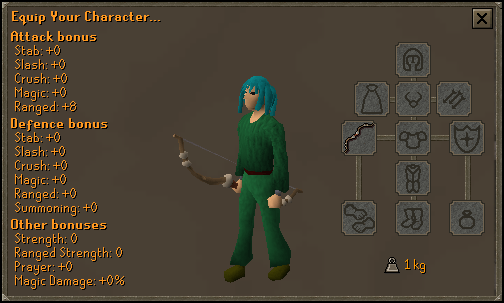 Just choose the option where you can take her equipment. Whatever option you choose you will get the equipment, at which point you should proceed down the stairs to find Reese, the third and final cultist. 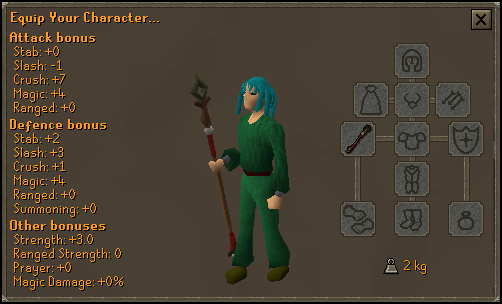 Xenia recommends you kill melee fighters with magic, so be sure to pick up Caitlin's magic equipment! In case you are unfamiliar with how magic works, be sure to check out the Magic skill guide on how to use magic before continuing. Once you are downstairs, head south until you reach a tomb door. Open the door, and Reese will immediately talk to you. You can choose any option, as the results are all the same: He will attack you. You will attack him back, using the Wind Strike spell. Reese is also 20 life points, so defeating him should be just as easy as the other two cultists. Just like the other two cultists, you will be faced with two choices on what to do with Reese after you have defeated him. You can take the easy way out and kill Reese, or you can question him and learn more about the storyline. 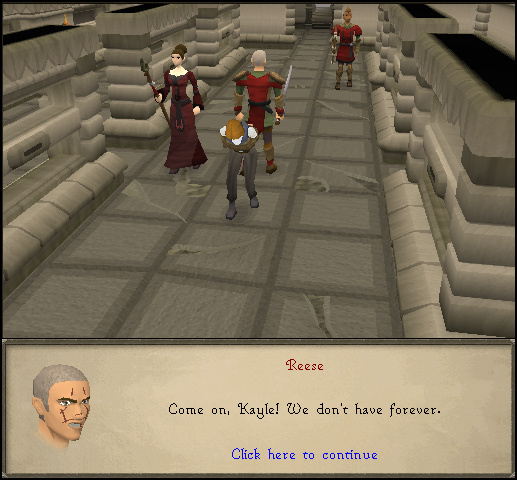 If you decide to question Reese, you will learn that he was about to send an army of the dead to Lumbridge so he could claim the town and end Saradomin's dominance over the city. After he reveals this, you can either kill him or take his stuff (like on the other two cultists). Unfortunately, Reese thinks otherwise, so in the end Reese dies. 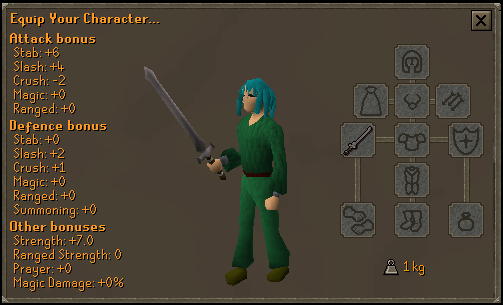 You can pick up the sword he leaves behind. Proceed into the chamber and untie Ilona, their hostage. 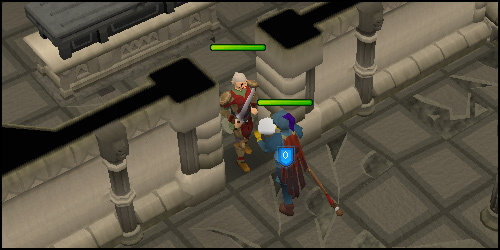 You will then be returned to the Lumbridge Graveyard. Ilona will give you her thanks, and you will be given the reward for stopping the cultists. After completing this quest, the Helmet of Trials can be obtained from Xenia once you have achieved 300 Quest Points. It offers no equipment bonuses and serves only as decoration and a symbol of your quest achievements. 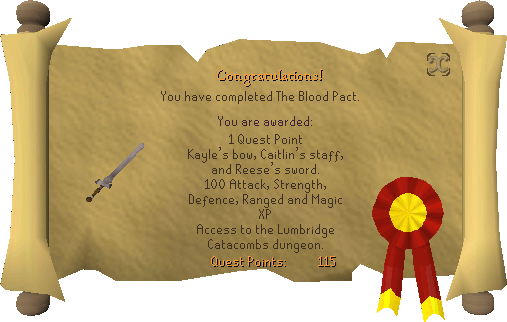 Along with access to the Lumbridge Catacombs, players can obtain some extra rewards. Second, players can obtain the Mask of Dragith Nurn by killing monsters within the Catacombs. Dragith Nurn will always drop the fifth piece of the mask. [^] Speak to Xenia and offer to help her. [^] Attack and defeat Kayle. [^] Question Kayle and/or kill him. [^] Attack and defeat Caitlin. [^] Question Caitlin and/or take her equipment. [^] Speak to Reese and defeat him after he attacks you. [^] Question Reese and/or kill him.